Talitha Rise comes from England, Sussex. An Abandoned Orchid House is her debut album. She is responsible for the vocals, guitars, keys and unusual instrumentations. Martyn Barker plays the drums and has multi instrumental skills. The album also includes many guest appearances, too many to mention here. Over to the music. Orchid House is the opening track of the album. You hear a quiet intro after which Talitha her velvet voice is coming to you. She really wants to tell you anything, share things with you. Now and then you will hear a violin. Heavy drum sounds lead you through the song. A beautiful track to start with. Valley starts with an acoustic guitar and the singing of Talitha. You will hear a background choir of men and you also hear the gambian riti. The song has a nice rhythm and there is happening a lot. Good job. My advice at Incantation is as follows: put on a headphone, raise the volume level to max, but, before this you need to put a stick of incense to get in the right mood. It all starts slowly with a choir in which Talitha sings. Slowly her voice becomes louder and louder. She sings beautiful lyrics in a very emotional way. There is space for a flute solo, some violin, duo vocals and a strong rhythm section which has a very added value. You are listening to one of the strongest songs of the album now! The singer songwriter song Hungry Ghost ripples and is not interesting for the real progressive rock fan. Bloodfox is another direct hit. It has an intro with radio sounds and a piano. It is a somewhat dragging song with beautiful lyrics. I hear much threatening in the drums. The theme of the song is well represented by the music. River is another simple straightforward song. Chapel Bell has another beautiful lyrical theme and beautiful videoclip (clip) that really touches you. Talitha is accompanied by piano. Now and then a guitar and on a given moment the rhythm section comes threatening and emotional to mind. This also is one of my favorite songs. The Lake is more up tempo and Talitha sings defiantly. It is a somewhat mysterious song that develops into a bit of fiercer music towards the end of the song. Twisted Tree has a nice acoustic intro, an acceleration to more up tempo work, after which a momentum is taken back, after which the foot is allowed on the pedal again, a great song. In Lifeboat it is all about the power of the voice of Talitha, musically supported by the piano. Alright, that are the songs, but what kind of style is Talitha playing? 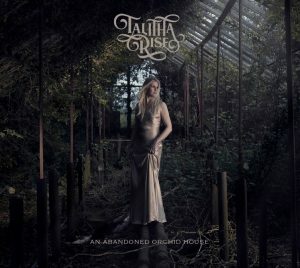 In the supplied information you can read, and I quote: “An Abandoned Orchid House is an album of ethereal, intimate soundscapes and powerful, emotive imagery from Sussex (UK) based singer-songwriter Talitha Rise. Her debut full-length album journeys through many different interior terrains that all in some way lead, via loss and alienation, to hope”. I can totally agree with that. It is in the corner of Indie-Folk and Progressive Folk. This is an album Talitha can be proud of because she exposes herself to this album.